Shasta Design has been manufacturing new 356 flywheels (6V ring gear) for about 4 years. 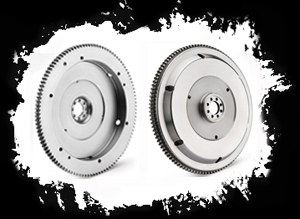 The flywheels are made from 1040 steel, which is very close to the original material used by Porsche. The ring gear is a very hard steel that is heated to about 400° F and shrunk fit to the flywheel. It will never come off! 1. A stock version, which is a duplicate of a Porsche flywheel except that it is lightened to about 14 pounds and balanced for use with a 200 mm Porsche clutch plate and disc. You supply the clutch and disc. 2. Same as above except it is sized for the VW200 mm bus clutch and disc lightened to 14 pounds and balanced. 3. Same as item two above, except Shasta Design will supply the VW bus 200 mm clutch plate and spring type disc, and balance the disc to the flywheel.